We sell Lipitor, the Generic Equivalent Atorvastatin, and Canadian Lipitor Online to those who have RX Prescriptions from your Doctor. Patients with high levels of bad cholesterol and Triglycerides in their blood can buy Lipitor online to help reduce the levels of these substances and increase their levels of good Cholesterol. It is also prescribed to patients with Type 2 Diabetes or Coronary Heart Disease, or other heart disease risk factors, to reduce the risk of Heart Disease, Strokes and Heart Attacks. 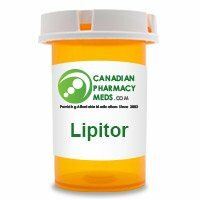 Lipitor is a type of medication known as a 'Statin', or HMG CoA Reductase Inhibitor. It works by blocking the enzymes in the liver that make cholesterol. As the liver makes less cholesterol, it uses cholesterol in the blood instead. This lowers the levels of bad cholesterol and triglyceride in the blood; studies have indicated that it may reduce levels by up to 60%. High cholesterol and Triglyceride levels are a risk factor for a number of medical conditions, including heart disease and strokes. Lowering the levels of these substances can therefore help to reduce the risk of these conditions. It is important that patients carefully follow the advice of their doctor in relation to dosage, as this will depend on their health and condition; normally, one dose will be taken daily. Patients can choose whether to take it with food. Lipitor does not cure High Cholesterol or eliminate the risk of heart disease completely, and it is only effective while the patient is taking it regularly. It is therefore important that patients keep taking their daily dose as directed, even if they feel well; otherwise, their cholesterol levels may increase again. Lipitor should normally begin to work within two weeks. Patients are likely to have regular check-ups with their doctor to monitor the effectiveness of Lipitor. While they are taking Lipitor, patients must ensure that they consume a healthy low-fat diet. This aids the lowering of cholesterol levels and will help the medication to work correctly. It is likely that their doctor will also advise them to undertake a program of exercise. They should avoid alcohol, as it can raise triglyceride levels. Side effects may include Nausea, Diarrhea, and Muscular pain. More serious side effects may include confusion, increased thirst, itching, fever, tiredness, jaundice, clay-colored stools, hunger, blurred vision, and weight loss. Very rarely, Lipitor can cause bones and muscles to break down, and this can cause kidney failure. Symptoms of kidney failure may include fever, dark-colored urine, unusual tiredness, and pain, tenderness or weakness in the muscles. The medication is not suitable for patients who are pregnant, breastfeeding, or who have liver disease. It may not be suitable for patients with kidney disease, thyroid disorder, excessive alcohol consumption, or muscle weakness. Patients with any of these medical conditions should seek advice from their doctor before they start taking Lipitor. In addition, other medicines may interact with Lipitor and cause side effects. Examples of such medications include diltiazem, antibiotics, HIV medications, birth control pills, antifungal medications, steroids, heart or blood pressure medications, cancer medications, niacin, and immunosuppressants. Grapefruit juice can also interact. Could Type 1 Diabetes Undermine Women's Heart Health?